UK Election media review: are our politicians tackling the issues? We are five weeks away from the UK General Election. That’s right, five weeks. A shock, given that we have yet to see any real debate or discussion from our future leaders on any of the things that actually matter to people’s lives. Or have we? I decided to test this hunch. I reviewed the media coverage from the past week to uncover whether the key parties bothered to say anything of real substance and interest on the big issues that matter to the electorate. Or have they just spent the week joshing and jockeying between themselves for kicks. Let’s see shall we. > So what matters to the electorate? First, the election issues. According to the latest poll by ComRes/ITV, the big issues people care about are: the NHS, immigration, the economy, and welfare/benefits — in that order. That list broadly matches a BBC/Populus survey from January, which showed that the issues the electorate most want the media to cover are: NHS, the economy, immigration, welfare/benefits/pensions, and jobs and pay. I decided to go with ComRes as it’s more up to date. And shorter. > How do we know if politicians have said anything substantive on these issues? A quick and dirty method. I reviewed the front pages of three newspapers — The Guardian, The Telegraph and The Sun — for the week 17 March – 24 March — to see if an announcement had made the headlines. 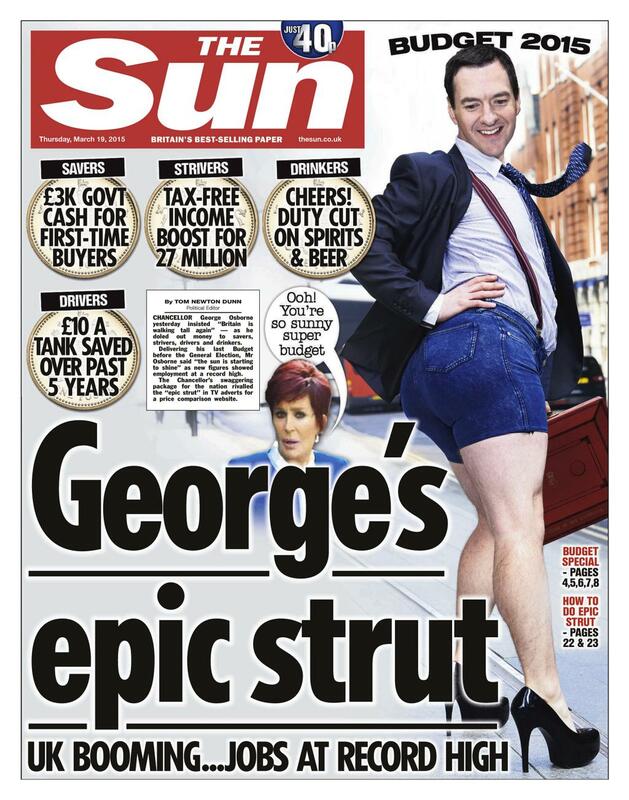 Big thanks to Nick Sutton’s Tomorrow’s Papers Today tumblr…it was surprisingly hard to find an archive of front pages. Anyway. To get a bit more 24/7 coverage in the sample and to make up for my front page bias, I also reviewed the Facebook feeds for C4 News, ITV News and BBC News for the same period. What I was looking for was any policy announcement-led news from any party on any one of these big issues over the past week. > Here are the results. There was nothing at all from any party on any of these media channels until today. 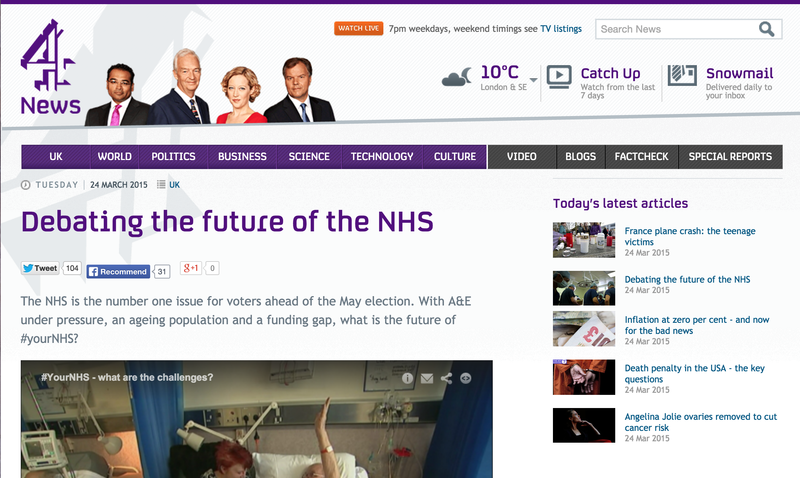 This evening, Channel 4 made a valiant effort to get the parties to say something of interest on healthcare. They invited both the health secretary, Lid Dem Health minister and shadow health minister on the show for a ‘#YourNHS debate’. They served three Facebook posts on the matter over the course of this evening (as well as an earlier post on Cameron being shouted at at an Age UK event.) There was some discussion between the parties on how to meet the £8billion shortfall in the NHS budget by 2020. Few clear differences emerged however, with Jeremy Hunt and Andy Burnham largely agreeing with each other that treating cancer is ‘a good thing’. Thank god. But aside from that moment on Channel 4 today, a deafening silence from the politicians on the NHS. Nothing at all from the politicians on these chosen media channels all week. 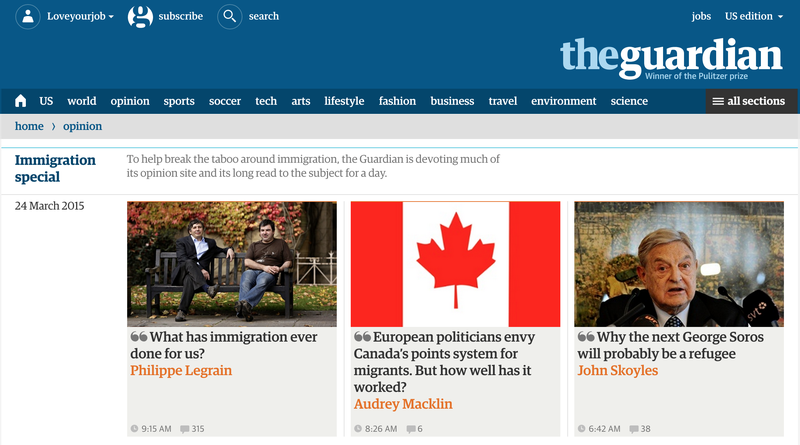 The Guardian is however running its own special report on the benefits of immigration, presumably in the absence of anyone else making a cogent argument on the matter. But putting aside this media-led reporting, none of the major parties have tackled immigration in any way this week. Probably this is a good thing – at least it keeps Farage off our screens for a little longer. So let’s not complain too much on this one. The budget announcement on Thursday managed to put a big tick in the ‘Economy’ box, and a bit of a pencil mark in the ‘Welfare’ box. Well done George — front page and Facebook news points across all outlets for a pile of measures including cutting income tax rates, ISA benefits, some changes to pension pots and extra funding for mental health services. Setting aside the coverage on the budget, it’s here that we see the biggest overall volume of front page and FB news across all media outlets. Whether it’s Boris pretending to look flattered that Cameron has named him a potential successor; Salmond boasting about all the power-broking he will be able to do in a Labour-SNP voting bloc; or Cameron finally acquiescing to a 7-way TV debate, these ‘news stories’ made the front page of all but The Sun (of course. see above. ), and into the newsfeeds of all three TV stations. Nothing good. But maybe they just haven’t really gotten started yet? Here’s hoping. The 64th session of the UN General Assembly started today, with diplomats and leaders from every country in the world travelling to New York to once again try to put the world to rights. As ever, the annual fanfare that marks the beginning of what will be a long season of talks, meetings and committee sessions will begin with a short(ish) speech from the Secretary-General, following by a silent meditation, followed by speeches. A lot of speeches. And from next week, Presidents, Prime Ministers, Chairpersons and other leaders of numerous titles will take to the podium, each voicing their opinions on what should be top of the UN’s agenda. However, most people won’t be aware of this. News coverage so far has been virtually non-existent, and when it does ramp up, it is of course more likely to focus on what’s bound to be a controversial speech from Mahmoud Ahmadinejad than it is on the plight of smaller nations like the Maldives, who come back every year screaming (as loudly as the UN protocol will allow) that climate change threatens their very existence. Having said that, I’m not surprised or even too concerned about this lack of public awareness of the General Debate. Within the international walls of the UN itself, every speech will play out to a packed out GA, and the issues on the table will be well known and understood by those that are in a position to make the decisions. Also, a lot of the speeches are very boring. Realistically, there are only going to be a few moments that will say something new, and therefore be deemed newsworthy. What the lack of media coverage does indicate however is how little we seem to care about what goes on in the Glass Building on New York’s 1st Avenue. And why would we? Bureaucracy and political will (or lack of it) hamper the UN’s ability to take meaningful action time and again. Virtual deadlock on the Security Council, where at least one of the P5 (USA, UK, China, Russia or France) vetoes nearly every resolution that could actually make a difference, makes the UN’s main chamber little more than a frustrated talking shop. But I do love it. It’s a kind of tough love. I genuinely believe that it is an incredible institution and a force for good in the world. The very fact that somewhere like it exists, somewhere which invites people from every corner of the globe to work on making the world a better place, well, it really gives me hope. Where else are the major global issues – climate change, poverty, disease, human rights – going to be tackled? And tackled jointly, meaningfully, and with true international consensus? For these reasons the UN is deserving of our attention if not our support. But it definitely a prime candidate for some tough love. And with Obama primed to take the stage – it just might get it. My big hope for the General Debate is for the USA to demonstrate that they think the UN is worthwhile. Eight years of a hostile Republican Government has marginalised the UN in the minds of the world’s only super-power, and therefore for the rest of the world. Obama offers a chance for some real commitment to making the UN work, and with the weight of the US behind it, it just might happen. No doubt Obama will have some harsh words for the UN community about reform but I, like everyone else who has worked in the Glass Building, will be hoping those words are under-pinned with a spirit of commitment, vision and hope. God knows the world needs it. This documentary and video material has been selected to help you get to grips with this particular conflict. Some of the videos I’ve been directed to by my wonderful I-P course tutor, and some of them I’ve found myself. Where possible, I’ve embedded the videos into this article. This three-part series offers an excellent overview of the history right from the roots of modern Zionism in the later 1800s, right through to the present day efforts for peace. Overall, it’s relatively balanced and dispels a lot of the myths (like the idea that Palestine was a barren land when the Jewish people started to settle there), and helps the viewer understand how this conflict developed into what it is today. Each of the three programmes is split into two parts, each lasting about 10mins. Here’s part one of the Pioneers episode. OneVoice is a campaign which aims to bring together the moderate masses on both sides to work together, challenge the extremists and ultimately bring an end to the conflict. Right now they have 650k people signed up in support of a peaceful two-state solution, roughly half of them Israeli and half of them Palestinian. This video features people from both sides talking about the movement, and their desire for peace. A low-key ‘fly on the wall’ clip showing how Israeli activists are working to support the Palestinians in resisting settlers. It comes from that great blog Global Voices and their recent interview with peace activist Ibn Erza. If you know of any other videos that provide an insight into this conflict, be sure to comment on this article and let us all know about them.